☮ Amerikansk præst, pacifist og borgerrettighedsforkæmper, Philantropos, The Apostle of Peace / Fredsapostlen. Arbejder omkring 1801 i Florida med at frigive slaver. Handelsmand i Georgia, hvor Ladd tjener en mindre formue. Ophører med at sejle som kaptajn i handelsflåden på grund af krigen i 1812. Efterfølgende godsejer i New England. Taler den 4. juli 1814 om religion, virtue and knowledge shall rule and the Empire of Peace shall be established. Året efter er Ladd stiftende medlem af Massachussets Peace Society. 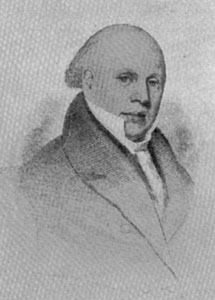 William Ladd begynder udgivelsen af de første Essays on Peace and War, i avisen the Christian Mirror i Portland, Maine, i juli 1823. Disse artikler udgives i en antologi i 1825. Samme år anmelder Ladd Commodore Porters Journal of a Voyage in the Pacific Ocean in the United States Frigate, Essex. I anmeldelsen kritiseres så vel krigshandel som slavehandlen. Også i 1825 kritiseres opstillelsen af krigsmindesmærket ved Bunker Hill, fordi future generations will look upon the column as a monument of the barbarism and anti-Christian spirit of our age. Burritt, Elihu: Willian Ladd : The Apostle of Peace. - New Vienna, Ohio : Peace Association of Friends in America, 1873. - 16 s.
Hemenway, John : Memoir of William Ladd with an introduction by Elihu Burritt, 1872. Ladd, William: An Essay on a Congress of Nations : Reprinted from the original edition of 1840 with an introduction by James Brown Scott. New York : Carnegie Endowment for International Peace. 1916. Ladd, William: Annals of Bakerstown, Vol. 2 (First Series). Ladd, William: The Essays of Philantropos. - Exeter : J. T. Burham in behalf of the Exeter, and other Peace Societies, 1827. - 173 s.
Ladd, William: The French Soldier. 1831? Ladd, William: History of Alexander the Great. 1832? Ladd, William: Howard and Napoleon Contrasted. 1831? Ladd, William: Letters from an American. - London :  63 s.
Ladd, William: Obstacles and Objections to the Cause of Peace. 1838?. Ladd, William: On the Duty of Woman to Promote the Cause of Peace. Ladd, William: An Oration pronounced at Minot, Maine, on the Fourth day of July, 1814. Ladd, William: A solemn appeal to Christians in favor of the cause of pernament and universal peace. - Boston : The American Peace Society, 1836. - 38 s.
Ladd, William: Reflections on War. The Minot Peace Society. 1830. Ladd, William: The Sword or Christmas Presents. 1830? Prize Essays on a Congress of Nations, together with a Sixth Essay. - Boston : The American Peace Society, 1840.